This is what I also remember seeing in TV interview for which I provided the link above. Will be debt free in 2 years from now. One more thing management said is that its craters only to domestic market. Its very good that contrarian views are being presented by other forum members. I am not defending the promoters but definitely the decision taken by them can be analysed. The Steel sector is an uptrend and the cycle is expected to continue for at least 18 -24 months. The demand of steel is robust and the steel prices are at all time high as advised by the management. The companies Iron ore mines are expected to ope-rationalised from April 18 and as per sources the company will be setting a Pellet Plant which will be very beneficial for the company. The company has also advised to double its capacity in PVC division. Any CAPEX has to be funded either from Internal Cash accruals or Equity infusion or Debt. Since the cash accrual are not sufficient to fund the expansion and due to sudden change in market dynamics QIP funding at desired valuation is not available the left source for funding expansion is DEBT. As the company is not over leveraged the decision at this stage is not fundamentally a bad decision. The companies performance has no doubt improved significantly however as far the track record of management is concerned although SEBI has given clean chit, the investor community has not. The management should be bold enough to admit that there debt repayment plan is being delayed due to CAPEX and unsuccessful QIP. The management should conduct investor concall after quartely results so that investors could clarify all their doubts. One more thing is that why is the management not borrowing debt from Banks. The companies operating performance are satisfactory and improving , the management guidance is to close the financial Year 2017-18 with revenue of Rs 3000 Cr. The 9M sales was Rs 2025 Cr so for Q4 sales will be around Rs 975 Cr and at EBIDTA at 25% margin will be around 243 Cr. The valuations at this levels are very comfortable. Senior memebers are requested to guide on the future performance outlook of the company, management and industry. From the interview - it is clear that the company does not have any international sale. Consequently the direct impact is not there on the company due to US tariffs. There might only be an indirect impact, however from the prevailing steel prices & volumes of steel imported by US, the indirect impact also appear to be limited to me. Given 24% correction in the share price in 2018, there seems be limited downside left in this counter. Just going through the interview of Shankar Sharma and as per his statement he is bullish on mid cap and small cap companies and particularly in Metal Segment (did not specified any particular name). 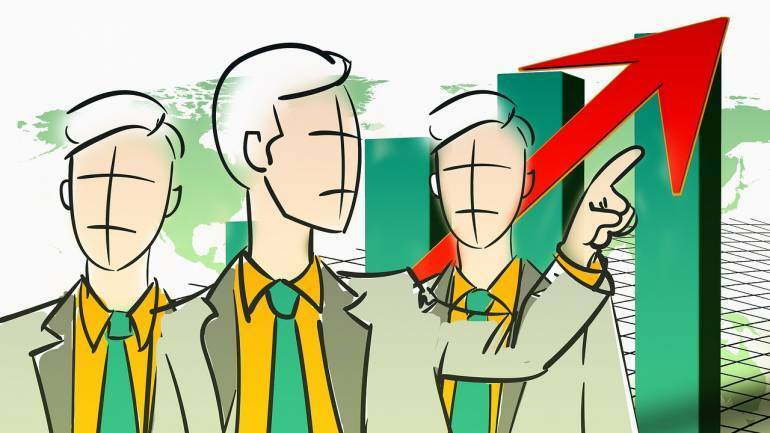 One thing which I inferred from his interview that the during the market down fall rather then looking at the share prices on daily basis which would not benefit any way, it would be better that we re visit the fundamentals of the company and analyse whether there is any deterioration in the company performance or sector outlook. Do you know what is the Iron ore capacity that will come on stream on April-2018 onwards? I wanted to know what percentage of their iron ore requirements will be supplied by their own mine? Pkease check last three quarters investor presentation, you will get the answers. One question - who are the QIP investor apart from promoters and why would they invest at above market price?. The only reason to buy through QIP at a higher price rather then purchasing outright from the market at lower price is that in QIP mode you only need to pay 25% of the price upfront and remaining 75 % over a period of 18 months. The investor might not have funds for out right purchase from the market or it might be that it might have committed itself by paying 25%. QIP and warrants are different. QIP is fully paid up. Eligible securities for QIP include equity shares, fully and partly convertible debentures or any securities but not warrants. Just a small clarification so that one doesn’t get confused between QIP and Warrants. But rest everything you’ve said is right and is applicable for warrants issued to promoters of Prakash. Thanks for the clarification, So if management has to pay the entire money upfront, why are they doing it at above CMP? Although, it might be regulatory reasons, I am just curious to understand the thinking behind this - knowing the promoter history. In a clean management perhaps I would not have been so much cynical. Is it a True value add or sentiment improvement or does management expect that the price would rise in the near future if it delivers good performance? Also, typically does equity dilution suppress the potential gain from the stock? There seems to be lot of confusion around QIP and Warrants. Here is a link on QIP, promoters are not eligible for QIP. Here is a link on Warrants. 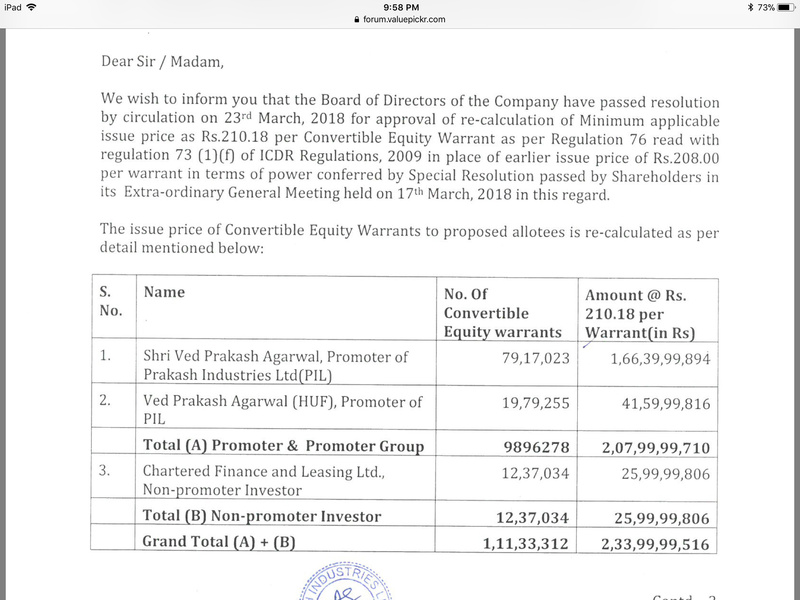 The promoters of Prakash revised the price of conversion of warrants voluntarily to Rs218/-, though they could have bought the warrants to convert at Rs.208/-. we know the current share price. So interpret in your own way. Here is the link explaining warrants. So, promoter has a upper hand. Heads I win tails I don’t loose much. Lets hope we get a strong upcycle in steel and get over with this issue. I am in net loss on my purchase that why thinning whether to book loss or to stay invested. Just to correct you, the revised price is 210.18 and not 218. Revising warrant conversion price from 208 to 210.18 which is 1% more is a non-event except maybe Promoter wants to subtly remind us all what he thinks the price of his company should be w.r.t current price around 170.